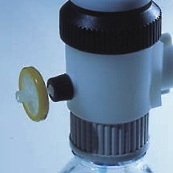 The first patented Bottle Top Dispenser that can be air purged without any loss of reagents. Three models are available, the LabMax Standard for most acids, LabMax S for solvents, PTFE-swelling medias, and LabMax HF for hydrofluoric acid. 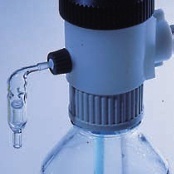 Each unit is supplied with standard accessories for immediate mounting on bottles with a discharge tube. A range of additional accessories is available. Easy air purging: Turn the operation mode selector to the right at a 90º angle. A marker and the discharge tube will indicate the right position. Remove (purge) the air by several pumping actions. No reagent is lost as pumping is done in a closed loop. To prevent air exchange between reagent and room, the LabMax has a bushing for the simple attachment of filters, calcium chloride tube or check valve. Easy to direct discharge tube: No matter how tight you secure the LabMax, with or without the adapter, you can direct the discharge tube with 1 simple turn, wherever you wish to direct it. Easy volume selection: A quick-adjust knob does volume adjustment. A sprocket sets the desired volume. Just push the knob, move to the desired volume and release. If the LabMax has to be disassembled for cleaning, it does not need to be re-adjusted after re-assembly; the zero point is part of the construction and is automatically calibrated. Patented piston completely displaces the reagents with each stroke, smoothly and fatigue-free. The dispensing glass cylinder is protected by a transparent plastic coating, which allows the user to view and control the liquid in the glass cylinder. For environmental and cost factors, reagents can be transferred easily without loss. Turn the operation mode selector 90º to the right and the residual amount inside the cylinder will be pumped back into the bottle or container. 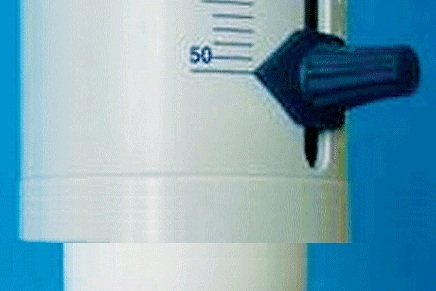 By turning the operation mode selector by 80º, all liquid in the discharge tube flows back into the bottle. It is almost impossible for any leakage to occur when it is in this position. 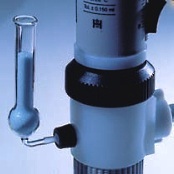 The LabMax is completely shut down and no accidental discharge will occur by inadvertently moving the piston. This is clearly indicated by the position of the tube and the setting of the operation mode.